This Saturday in Reston there is a great opportunity to check out some of the greenest homes in the region, including a stop at "The Nature House" education center which features wooden porch posts milled from oak trees that fell when Hurricane Isabel hit Reston. Saturday, October 16, 2010 - 10 a.m. until 5 p.m.
Reston, VA - Reston Historic Trust will present the 9th annual Reston Home Tour on Saturday, October 16, 2010 from 10 am until 5 pm. The self-conducted tour takes visitors for an exclusive viewing of five outstanding private homes located throughout Reston’s renowned neighborhoods and clusters. Each tour destination features inspiring interior design and architecture, and demonstrates various ways of living and building ‘green’. This year’s tour will also feature a special stop at “The Nature House” education center where attendees can enjoy an exclusive chef demo, tastings, behind-the-scenes views and naturalist-led walks. Ticket holders will receive a beautiful program filled with stories and illustrations of each tour home, restaurant certificates, and much more. For more tour information, call Reston Museum at 703-709-7700, or e-mail Restonhometour@yahoo.com, or visit www.restonmuseum.org. Since 2002, Reston Home Tour is presented annually by Reston Historic Trust to benefit Reston Museum, located at 1639 Washington Plaza in Lake Anne Village Center, the historic heart and soul of Reston. Reston Museum has been fully renovated and boasts a very special exhibit space featuring “From New Town to Our Town”, an onsite shop, plus special events and programs. Visit Reston Museum during the tour, or during its regular hours of Tuesday through Sunday from 12 until 5 pm. For information call 703-709-7700, e-mail RestonMuseum@gmail.com, or visit www.restonmuseum.org. Support and sponsorship of the 2010 Reston Home Tour comes from numerous businesses, including Clyde’s of Reston, Paolo’s Ristorante, The Wine Cabinet at North Point, Flower Gallery of Chantilly, Herndon Florist, Lake Anne Florist, Reston Floral Design, Ultra Violet Flowers, and media partner Fairfax County Times. Reston Museum, Lake Anne Florist, Appalachian Spring, GRACE, The Wine Cabinet at North Point, The Nature House. This year’s tour will showcase green building and sustainable design practices, emphasizing both big and small things that can be done to shrink our carbon footprint. 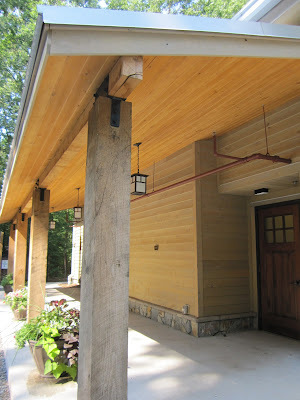 The self-guided Reston Home Tour includes five private residences in Reston, and The Nature House that opened in the Walker Nature Education Center in November 2009. After 15 years of condominium living in Tysons Corner, Wes and Jackie were ready for a yard, as well as additional display space for their collection of textiles, paintings and sculpture, so in 1995 they moved into this former Gulick model home. Though much of their artwork was acquired during international travels, Wes’s days at the Corcoran School of Art are also represented. Dinners are always special on their multi-level deck overlooking the “walking woods garden”. Since 1970 Reston Interfaith has answered the tough question some of our neighbors face: Where will I live? Working with Reston Interfaith, Graceful Spaces helps families turn a house into their home. Together these two local, non-profit organizations empower these families to take the path toward self-sufficiency by providing attractive and affordable housing. Their investment in the health of our community benefits us all. This former Belgian block home, built in 1963, was rebuilt by Cathy and Mark after purchasing it on the courthouse steps in 1994. It’s perfectly sited to take full advantage of their expansive views of Lake Anne. An interesting mix of glass block, mahogany floors and sky-lit spaces surrounds the owners’ amazing collection of fine art and craft, much of which was purchased locally at the Northern Virginia Fine Arts Festival. A long search led from their detached traditional home to this “in-town” space. Recently retired, Tom and Martha have found this an energizing place to live – a walk-friendly neighborhood where both country and city are immediately at hand. Inheriting many pieces of furniture from the previous owners, they concentrated their efforts on accessories, art, color and textiles. Their rooftop terrace, with nightly light shows, is accessed by their private ‘stairmaster’ (all four levels of it!). Reston’s Nature House is a place to be proud of – truly a model of sustainable design and construction for a very special facility. Tour attendees can enjoy scheduled activities [see schedule, below] such as naturalist-led walks and behind-the-scenes views of this LEED Gold certified* building, along with edification on green building practices. *Only 17 buildings in Virginia have earned the distinction of LEED Gold certification. “Meet the Chef” of Paolo’s Ristorante, presenting complimentary tastings of autumn-inspired fare from 11 am until 4 pm, exclusively for tour attendees. In every discussion of this modern masterpiece, owners Margaret and Shashi are sure to talk about the light, and visitors to this amazing home will see how that light is important. The highlights of this home are extensive: Venetian plaster and etched glass walls, a stainless and wenge social island, back-painted, low-iron glass, 2-story glass addition with green roof adjoining the reflecting pool, iridescent tiles and a quarter-sawn oak and glass floating stairway. Everything here has been done with the attention to detail and passion rarely found in today’s residential housing. See home photos and ongoing updates by following Reston Home Tour on Facebook. 10:30 a.m. and 2:30 p.m.
• Nature walks will be led by Reston Association’s Environmental Resource Manager, Claudia Thompson-Deahl, author of The Nature of Reston. • Behind-the-scenes tours of the building will be offered by Reston Association’s Nature Center Manager and Executive Director of the Friends of Reston, Katie Shaw. Upstairs, see staff offices and downstairs, the geothermal ground source heat pump equipment. Some of those involved with the design and construction will be also be on hand for more information about the building and its grounds. Start the tour at any location of your choice using the map provided on the ticket and inside the tour program. Wear comfortable shoes. You may be asked to remove your shoes at some of the homes, especially if weather is wet. Bags will be provided for shoes to be carried until exiting the home. Reston Home Tour is not recommended for children, and those under the age of 10 cannot be admitted into the tour homes. The beauty of that Nature House is how it speaks and breathes serenity in every space and corner. I bet it would be lovelier for those support columns if it can be intertwined to become round columns to a musing reflection of a typical tree. It looks absolutely stunning. I'd love to live in a house like that, it looks so tranquil there. Why Are Nordic People So Happy? Electric Motorcycle Rolls into D.C.